Can I add more than one social media to my Octoly account? Octoly is available on multiple social platforms such as YouTube and Instagram. 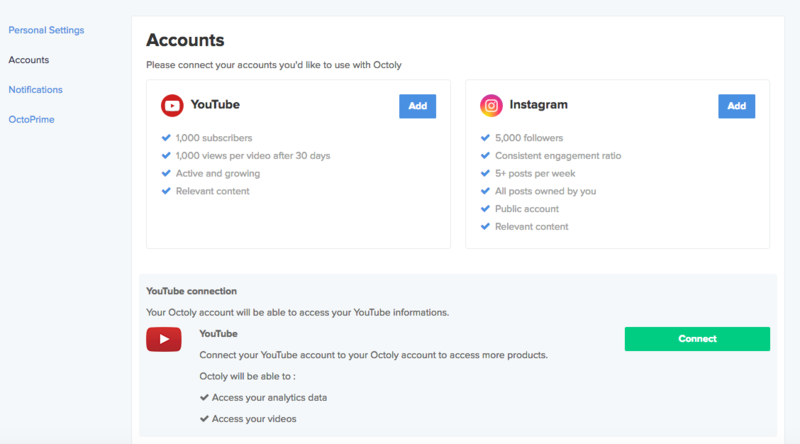 If you are already a registered user on Octoly, but have an account on another platform that is eligible to Octoly, you may connect your other account to gain access to even more products at once! To qualify to be an influencer on Octoly, your account has to meet the Octoly criteria. It’s so simple to connect your Octoly account with all of your social media channels and access even more opportunities! So, what are you waiting for?